You have properly set up, washed, and sanitized your Vollrath frozen beverage counter top dispenser. It’s time to learn how to operate it safely and effectively. To ensure the highest product quality, safe operation, and long life from your dispenser, familiarize yourself with the components and operation of the unit by reading the operator’s manual. Let’s go over some of the basic controls. The dispensers equipped with a main power switch and a light switch. In addition, each bowl is individually operated by a cold drink and frozen beverage switch. 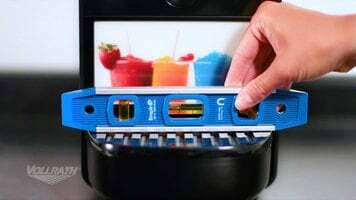 This function makes it possible to dispense both cold drinks and frozen beverages from one machine. When the bowl is set to cold drink mode, the desired beverage temperature is controlled by the corresponding temperature control knob for each bowl. When the bowl is set to frozen beverage mode, the desired frozen mix consistency is controlled by the corresponding adjustment screw for each bowl. Temperature control knob is not used in the frozen beverage mode. Now that your familiar with the controls, it’s time to put your machine to work. Be sure to sanitize immediately before use. To remove any remaining sanitizing solution or a small amount of potable water of prepared beverage mix into the bowl to flush out any remaining sanitizing solution. Drain the bowl. Make sure the spigot is in place and in the closed position. Fill the bowl with a desired product making sure not to exceed the maximum liquid capacity of your model. When using freeze dried bases or mixes that need to be diluted with water prepare the product in a separate container and pour into the dispenser when it is thoroughly mixed and completely dissolved. If using fully prepared mixes, follow the manufacturer’s instructions carefully to properly use the product. If using natural products like coffee, lemon, or orange juice in a separate container dissolve three and a half to seven ounces of sugar into each quart of product depending on the sweetness desired. After filling the bowl with chilled mix replace the cover. To start the dispensers turn the main power switch to the on position. For cold drinks set the cold drinks and frozen beverage switch to the number one position. For frozen beverages set the cold drinks and frozen beverage switch to the number two position. Finally, set the light switch to the on position. Here are a few more helpful for optimal operation. The time required to make servable product may vary based on factors such as the surrounding air temperature, initial product temperature, density adjustment, sugar, or if the mix contains dairy, the fat content of the mix. Filling the bowl with precooled product decreases the time needed to serve cold or frozen products from the dispenser. Reduce your recovery time by refilling the bowls with product before the product level is below the halfway point of the cooling cylinder. Operating the dispenser in frozen beverage mode unattended for long periods of time such as overnight is not recommended. To store product in the machine overnight, simply position the cold drink and frozen beverage switch to the cold drink setting. To return the product to frozen beverage mode, position the cold drink and frozen beverage switch to the two position, one hour before your desired serving time. Finally, frozen beverage consistency adjustment is simply made by using a standard screwdriver to turn the adjustment screw located on each bowl. Turn the screw clockwise for thicker product or counter clockwise for thinner product. For additional features, product information, and helpful hints visit us online at Vollrath.com. Whether you're making slushies for your small convenience store or frozen cocktails for your next upscale catered event, this Vollrath frozen beverage machine will meet the needs of any food establishment. Learn how to safely and effectively operate this Vollrath frozen beverage machine to ensure the highest product quality for your customers. A step-by-step guide on the initial setup of your Vollrath Granita machine. Learn how to properly give your Vollrath Granita machine a thorough cleaning. Properly diagnose electrical and component failures with your Hoshizaki KM cuber system by using this 10 minute check-out procedure!